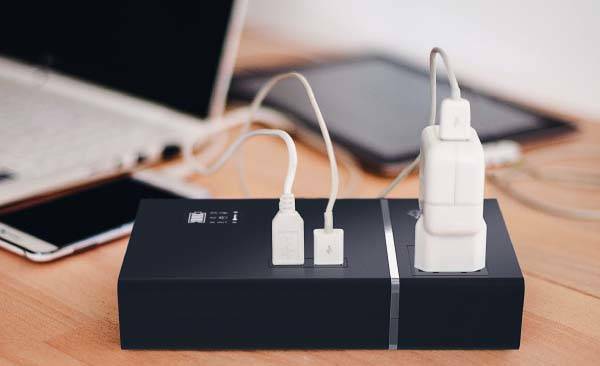 Using integrated AC outlet and USB ports PowerPlant portable power bank not only charges your mobile devices, but also Power your laptop or even a LED TV. Want to learn more about the universal charger? Let’s continue checking. The PowerPlant is a powerful and versatile power bank that measures 95 x 185 x 35mm and weighs 635g. As we can see from the images, the portable charger shows off a sleek, low-profile appearance design, and the portable form factor allows you to easily store the charger in your bag for various outdoor activities. 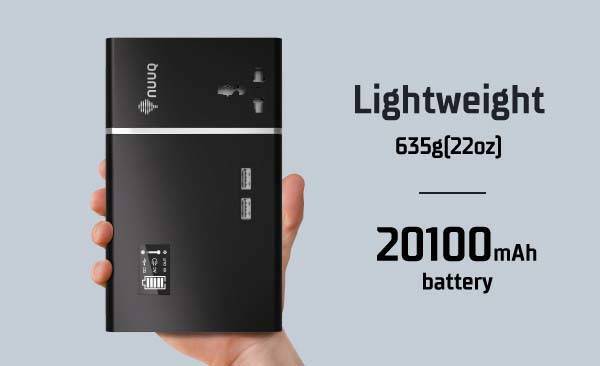 The power bank comes equipped with 20100mAh battery pack, and in addition to two 2.4A 5V fastcharge USB ports, the PowerPlant also features a universal socket that supports UK, US, European and Australian plugs, so you can use it to charge your smartphone, tablet, laptop and power some small appliances like TV, coffee machine and more. Furthermore, its battery pack is interchangeable. This means you can carry multiple PowerPlant battery packs in order to charge more devices during a long outdoor adventure. Using a 19V fast charge charging port, the power bank can be recharged more efficiently. In addition, the portable charger has passed IP4 testing to make it splash-proof, and an integrated LCD display shows you battery level, temperature, AC, DC and In/Out status. The PowerPlant has been available for preorder on Indiegogo (flexible crowdfunding goal). You can pledge $129 to preorder the powerful power bank. It would be shipped in November 2017 (estimated). BTW, don’t miss the USB-C Power Delivery power bank and more cool related gadgets by following tags.